Info Young was reared in a middle-class black family, attended segregated Southern schools, and later entered Howard University (Washington, D.C.) as a premed student. But he turned to the ministry and graduated in 1955 from the Hartford Theological Seminary (Hartford, Conn.) with a divinity degree. A pastor at several black churches in the South, Young became active in the civil-rights movement--especially in voter registration drives. His work brought him in contact with Dr. Martin Luther King, Jr., and Young joined with King in leading the Southern Christian Leadership Conference (SCLC). Following King's assassination in 1968, Young worked with Ralph Abernathy until he resigned from the SCLC in 1970. Defeated that year in his first bid for a seat in Congress, Young ran again in 1972 and won. He was reelected in 1974 and 1976. In the House he opposed cuts in funds for social programs while trying to block additional funding for the war in Vietnam. 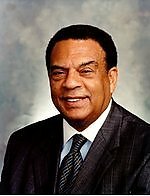 He was an early supporter of Jimmy Carter, and, after Carter's victory in the 1976 presidential elections, Andrew Young was made the United States' ambassador to the United Nations. His apparent sympathy with the Third World made him very controversial, and he was finally forced to resign in 1979 after it became known that he had met with a representative of the Palestine Liberation Organization. In 1981 Young was elected mayor of Atlanta, and he was reelected to that post in 1985, serving through 1989. Atlanta Mayor - Nov 07, 2017 D Ceasar Mitchell, Jr.